From a distance, the metallic starling looks just like another small black bird. However, at the right angle of sunlight, this beautiful bird shows an array of purples and green iridescence. Many starlings are native to European countries, but the so aptly named metallic starling is the only starling native to Papua New Guinea and surrounding Australian islands. This songbird species is known for the spectacular swirls and shapes they create in the sky, as they travel in colonies of endless individuals. They are best known for their unique style of intricate nests that hang from the trees of their breeding ground in Northern Australia. Pretty bird. Metallic starlings are medium-sized with a long, graduated tail. They appear to be “metallic” because of the purple and green sheen that reflects when the sunlight hits them just right. Both males and females look alike, being an all-black color with red eyes and a short bill. Contrary to adults, juveniles are brown with a white patch on their chest and gray coloration on the throat. As they mature they develop the red eye and black plumage. The final juvenile trait they lose is the white patch on their chest. Singing soprano. These birds have a very high-pitched song when communicating to one another. Their talents have also been known to include mimicry of other neighboring birds. Gregarious in nature, these birds have a constant chatter. Nesting colonies are fairly easy to find out in the wild because of the volume of individuals and vocalizing. These songbirds are adaptable to many habitats, including woodland, coastal wetlands, and rain forest. They are the only native starlings to Papua New Guinea and Australia’s nearby islands. They cover a large area because of migrating during the breeding season. At the end of the dry season, they migrate as far north as Queensland for breeding season. These birds typically feast on fruit and insects in the wild. Here at the San Diego Zoo, we feed them an omnivorous diet. Baby starlings depend on a high-protein diet rich in insects, including crickets and mealworms. Once sufficient muscle development occurs, fruit and pellets are offered to pack on the ounces. Adult metallic starlings are offered bugs, pellets, and fruit. Birds of a feather. These birds spend their days in large flocks consisting of thousands of individuals. They spend time in the trees feasting on fruit, nectar, and insects. As the sun sets, they prepare to roost overnight in trees that are close to one another. Before settling in, they gather and create a swirling display in the sky chattering away with one another. Eat, "Prey," Love. Metallic starlings, being small birds, have a wide variety of predators including introduced foxes, larger birds of prey, and dingos. These gregarious birds practice safety in numbers by staying together in a large flock. These birds are at risk when first leaving the nest at 21 to 25 days old. Group migration. These birds migrate to northern Australia for breeding in massive colonies consisting of thousands of birds. Here, they prepare globular woven nests that hang from the trees. This differs from other starlings that are cavity nest builders. Metallic starlings utilize grasses, bark, and feathers for building these intricate nests. Here at the San Diego Zoo, we provide extra nesting material such as excelsior, a packing material, for the birds' use. Breeding season is from August through early spring in the wild. Females can have multiple clutches during this extended period, laying one to three eggs per clutch. On average, females produce five to seven offspring during the entire breeding season. Juveniles leave the nest in 21 to 25 days. While they leave the nest, they do come back to their parents to feed for some time after. In early spring, the birds migrate back to Papua New Guinea and surrounding Australian islands. 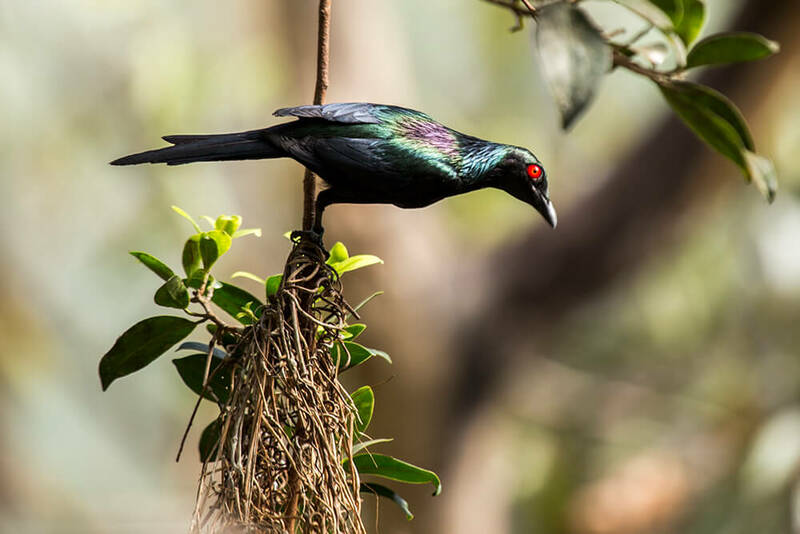 Look for metallic starlings in the Australian Outback aviaries, across from the Tasmanian devils. We have a breeding colony here where visitors can see the elaborate nests. Metallic starlings have been described as abundant. This bird serves an important role in its habitat as a seed disperser. Several tropical plants benefit from these birds traveling in mass colonies. The San Diego Zoo has a large breeding colony of these birds in the Outback aviaries. Many years of successful breeding has allowed us to share this species with other zoos around the country. We have sent birds to the Philadelphia Zoo, among others. Metallic starlings are also known as shining starlings because of their beautiful purple-green color that reflects with the sunlight. Researchers have found breeding colonies consisting of 400-plus nests in the wild. Metallic starling eggs are a pale blue color with brown spots.